For product designers, an understanding of the factors affecting battery life is vitally important for managing both product performance and warranty liabilities particularly with high cost, high power batteries. Offer too low a warranty period and you won't sell any batteries/products. Overestimate the battery lifetime and you could lose a fortune. That batteries have a finite life is due to occurrence of the unwanted chemical or physical changes to, or the loss of, the active materials of which they are made. Otherwise they would last indefinitely. These changes are usually irreversible and they affect the electrical performance of the cell. This page describes the factors influencing battery life. Battery life can usually only be extended by preventing or reducing the cause of the unwanted parasitic chemical effects which occur in the cells. Ways of improving battery life and hence reliability are also considered below. Battery performance deteriorates over time whether the battery is used or not. This is known as "calendar fade". Performance also deteriorates with usage and this is known as "cycle fade"
Battery Calendar Life is the elapsed time before a battery becomes unusable whether it is in active use or inactive. There are two key factors influencing calendar life, namely temperature and time, and empirical evidence shows that these effects can be represented by two relatively simple mathematical dependencies. A rule of thumb derived from the Arrhenius Law describes how the rate at which a chemical reaction proceeds, doubles for every 10 degrees rise in temperature, in this case it applies to the rate at which the slow deterioration of the active chemicals increases. Similarly the t1/2 (or √t ) relationship represents how the battery internal resistance also increases with time t. The graph below illustrates these effects. Battery Cycle Life is defined as the number of complete charge - discharge cycles a battery can perform before its nominal capacity falls below 80% of its initial rated capacity. Key factors affecting cycle life are time t and the number N of charge-discharge cycles completed. An obvious example is the Depth of Discharge (see below) which is a simple reciprocal mathematical relationship, but there are many more complex factors which can also influence performance. Lifetimes of 500 to 1200 cycles are typical. The actual ageing process results in a gradual reduction in capacity over time. When a cell reaches its specified lifetime it does not stop working suddenly. The ageing process continues at the same rate as before so that a cell whose capacity had fallen to 80% after 1000 cycles will probably continue working to perhaps 2000 cycles when its effective capacity will have fallen to 60% of its original capacity. There is therefore no need to fear a sudden death when a cell reaches the end of its specified life. See also Performance Characteristics. An alternative measure of cycle life is based on the internal resistance of the cell. In this case the cycle life is defined as the number of cycles the battery can perform before its internal resistance increases by an agreed amount., usually 1.3 times or double its initial value when new. In both cases the cycle life depends on the depth of discharge and assumes that the battery is fully charged and discharged each cycle. If the battery is only partially discharged each cycle then the cycle life will be much greater. See Depth of Discharge below. It is therefore important that the Depth of Discharge should be stated when specifying the cycle life. When battery systems are specified it is usual to dimension the battery in terms of its end of life capacity rather than its capacity when new. The graph below shows the results of a manufacturer's cycle tests of batteries used in electric vehicles sold in the USA. The obvious conclusion would be that, if the batteries were fully discharged and recharged on most days, they would be good for at least 500 cycles which would be equivalent to between one and two years of driving and even longer if the batteries were only partially discharged each day. BUT vehicle owners in Arizona and California experienced battery lifetimes of only a few months before the capacity dropped to below 80% of its"new" value with typical capacity reductions of 27.5% in only 300 cycles even though the ambient temperature was well below 60°C leading to complaints, lawsuits and embarrassment for the EV manufacturer. The explanation was that cycle testing was conducted with typical repetitive cycling at the specified charge and discharge rates of 1.5C and 2.5C with very short rest periods between cycles so that the battery was charged in 40 minutes and discharged in 24 minutes taking just over an hour per cycle. At this rate 500 cycles would be completed in about three weeks, but in actual use it would take nearly two years to complete 500 cycles. The conclusion was that the "test cycles"lasting an hour were much shorter than the typical "usage cycles" which may last for a day or more and that typical "accelerated" cycle testing did not take into account the affect of cell ageing with calendar life and we know from the graph above that calendar life is highly dependant on the ambient temperature. This has been confirmed by tests which paradoxically show that, despite the expected benign effect of lower operating C rates, by decreasing the charge and discharge rates to C/100 or C/200, that is 200 hours or more per complete cycle, the battery lifetime is actually reduced, particularly at high temperatures. This is simply because the calendar life losses become more significant the longer the cycle time. The expected lifetime must therefore be calculated from a combination of the cycle life and the calendar life. This is however a long and expensive process requiring many samples cycled to the end of their useful life and others tested at different temperatures under varying environmental operating conditions. See an Unconventional Alternative to Cycle Testing (below) for determining battery lifetime which could solve this problem. The most significant cause of calendar life losses is the build up of a passivation layer of unwanted chemicals on the surface of the cell's anode which increases its impedance while reducing the volume of active chemicals in the cell. See more about the passivation layer below. It should be noted that the model involved did not have an active thermal management system which could have reduced this problem by keeping the battery cool, at least some of the time. Batteries are electrochemical devices which convert chemical energy into electrical energy or vice versa by means of controlled chemical reactions between a set of active chemicals. Unfortunately the desired chemical reactions on which the battery depends are usually accompanied by unwanted, parasitic chemical reactions which consume some of the active chemicals or impede their reactions. Even if the cell's active chemicals remain unaffected over time, cells can fail because unwanted chemical or physical changes to the seals keeping the electrolyte in place. Fe3(PO4)2, Li3Fe2(PO4)3, Fe2PO5, Fe2P2O7, FePO4, Fe(PO3)3, Fe7(PO4)6, Fe2P4O12, Fe3(PO4)2, Fe3(P2O7)2, FePLi2O, LiPO3, Li2O, Li3PO4, Li4P2O7, Fe2O3, Fe3O4, FeO, Fe, FeP, LiFeO2, Li5FeO4, LiFeP2O7, Li2FeP2O7, Li9Fe3(P2O7)3(PO4)2, P2O5, and others. These compounds arise just from the cathode material, but there are many other elements present in the anodes, electrolytes, binders and other additives which are used in the cell, making many more combinations possible. The result is a reduction in the quantity of active chemicals in the cell and a consequent reduction in cell capacity. Contamination of the active chemicals also creates seed points from which further unwanted chemical reactions may be initiated. Subjecting the battery to excessive currents also brings on these problems resulting in a reduction in the battery cycle life. See Charging Times in the section on Chargers and the notes on Passivation and Charging Rate below. It is the task of cell designers and battery applications engineers to create the electrochemical recipe and the stable operating conditions to ensure that the desired reactions are optimised and the undesirable side effects are suppressed. Chemical reactions internal to the battery are driven either by voltage or temperature. The hotter the battery, the faster chemical reactions will occur. High temperatures can thus provide increased performance, but at the same time the rate of the unwanted chemical reactions will increase resulting in a corresponding loss of battery life. The shelf life and charge retention depend on the self discharge rate and self discharge is the result of an unwanted chemical reaction in the cell. Similarly adverse chemical reactions such as passivation of the electrodes, corrosion and gassing are common causes of reduced cycle life. Temperature therefore affects both the shelf life and the cycle life as well as charge retention since they are all due to chemical reactions. Even batteries which are specifically designed around high temperature chemical reactions, (such as Zebra batteries) are not immune to heat induced failures which are the result of parasitic reactions within the cells. A is a frequency factor related to the frequency of collisions between molecules, usually taken as a constant over small temperature ranges. EA is the activation energy. A constant representing the minimum energy needed for the reaction to occur. As a more convenient rule of thumb, an approximation which is true for temperatures around room temperature - for every 10 °C increase in temperature the reaction rate doubles. Thus, an hour at 35 °C is equivalent in battery life to two hours at 25 °C. Heat is the enemy of the battery and as Arrhenius shows, even small increases in temperature will have a major influence on battery performance affecting both the desired and undesired chemical reactions. The graph below shows how the life of high capacity tubular Ironclad Lead Acid batteries used in standby applications over may years varies with the operating temperature. Note that running at 35 °C, the batteries will deliver more than their rated capacity but their life is relatively short, whereas an extended life is possible if the batteries are maintained at 15 °C. As an example of the importance of storage temperature conditions - Nickel-metal hydride (NiMH) chemistry in particular is very sensitive to high temperatures. Testing has shown that continuous exposure to 45°C will reduce the cycle life of a I-MH battery by 60 percent and as with all batteries, the self discharge rate doubles with each 10°C increase in temperature. Apart from the gradual deterioration of the cell over time, under conditions of abuse, temperature effects can lead to premature failure of the cell. This can happen even under normal operating conditions if the rate of heat generated in the battery exceeds the rate of heat loss to the environment. In this situation the battery temperature will continue to rise leading to a condition known as thermal runaway which ultimately results in disastrous consequences. The conclusion is that elevated temperatures during storage or use seriously affect the battery life. See further information in the sections on Lithium Battery Failures and Thermal Management section. These problems relate to sealed cells only. Increased internal pressure within a cell is usually the consequence of increased temperature. Several factors can play a part in causing the temperature and pressure rise. Excessive currents or a high ambient temperature will cause the cell temperature to rise and the resulting expansion of the active chemicals will in turn cause the internal pressure in the cell to rise. Overcharging also causes a rise in temperature, but more seriously, overcharging can also cause the release of gases resulting in an even greater build up in the internal pressure. Unfortunately increased pressure tends to magnify the effects of high temperature by increasing the rate of the chemical actions in the cell, not just the desired Galvanic reaction but also other factors such as the self discharge rate or in extreme cases contributing to thermal runaway. Excessive pressures can also cause mechanical failures within the cells such as short circuits between parts, interruptions in the current path, distortion or swelling of the cell case or in the worst case actual rupture of the cell casing. All of these factors tend to reduce the potential battery life. We should normally expect such problems to occur only in situations of abuse. However manufacturers have no control over how the user treats the cells once they have left the factory and for safety reasons, pressure release vents are built into the cells to provide a controlled release of pressure if there is the possibility that it could reach dangerous levels. External pressure, or lack of it, could also be problem when batteries are transported by air. Th low pressure in the hold could possibly cause venting and loss of electrolyte. At a given temperature and discharge rate, the amount of active chemicals transformed with each charge - discharge cycle will be proportional to the depth of discharge. The relation between the cycle life and the depth of discharge appears to be logarithmic as shown in the graph below. In other words, the number of cycles yielded by a battery goes up exponentially the shallower the DOD. This holds for most cell chemistries. (The curve just looks like a logarithmic curve however. It is actually a reciprocal curve drawn on logarithmic paper). 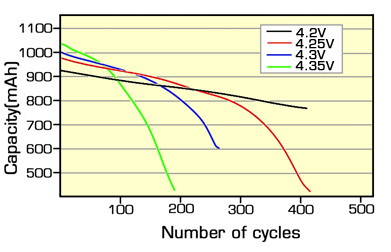 The above graph was constructed for a Lead acid battery, but with different scaling factors, it is typical for all cell chemistries including Lithium-ion. This is because battery life depends on the total energy throughput that the active chemicals can tolerate. Ignoring other ageing effects, the total energy throughput is fixed so that one cycle of 100% DOD is roughly equivalent to 2 cycles at 50% DOD and 10 cycles at 10% DOD and 100 cycles at 1% DOD. See also Cycle Life which shows how cell performance diminishes due to deterioration of the active chemicals as the battery ages. There are important lessons here both for designers and users. By restricting the possible DOD in the application, the designer can dramatically improve the cycle life of the product. Similarly the user can get a much longer life out of the battery by using cells with a capacity slightly more than required or by topping the battery up before it becomes completely discharged. For cells used for "microcycle" applications (small current discharge and charging pulses) a cycle life of 300,000 to 500,000 cycles is common. Mobile phone users typically recharge their batteries when the DOD is only about 25 to 30 percent. At this low DOD a lithium-ion battery can be expected to achieve between 5 and 6 times the specified cycle life of the battery which assumes complete discharge every cycle. Thus the cycle life improves dramatically if the DOD is reduced. Nickel Cadmium batteries are somewhat of an exception to this. Subjecting the battery to only partial discharges gives rise to the so called memory effect (see below) which can only be reversed by deep discharging. Some applications such as electric vehicles or marine use may require the maximum capacity to be extracted from the battery which means discharging the battery to a very high DOD. Special "deep cycle" battery constructions must be used for such applications since deep discharging may damage general purpose batteries. In particular, typical automotive SLI batteries are only designed to work down to 50% DOD, whereas traction batteries may work down to 80% to 100% DOD. See also how battery cycle life can be increased through Cyclic Redundancy of the cells. The cycle life of Lithium batteries can be increased by reducing the charging cut off voltage. This essentially gives the battery a partial charge instead of fully charging it, similar to working at a lower DOD as in the example above. The graph below shows the typical cycle life improvements possible. Reducing the charging voltage cut off voltage avoids the battery reaching its maximum stress point. See also Charging Lithium Batteries and Lithium Battery Failures. Battery life is also influenced by the charging rate.The capacity reduction at high discharge rates occurs because the transformation of the active chemicals cannot keep pace with the current drawn. The result is incomplete or unwanted chemical reactions and an associated reduction in capacity as noted in the paragraph on Chemical Changes above. This may be accompanied by changes in the morphology of the electrode crystals such as cracking or crystal growth which adversely affect the internal impedance of the cell. Similar problems occur during charging. There is a limitation as to how quickly the Lithium ions can enter into the intercalation layers of the anode. Trying to force too much current through the battery during the charging process results in surplus ions being deposited on the anode in the form of Lithium metal. Known as Lithium plating, this results in an irreversible capacity loss. At the same time, maintaining the higher voltages needed for fast charging can lead to breakdown of the electrolyte which also results in capacity loss. From the above we can expect that with each charge/discharge cycle the accumulated irreversible capacity loss will increase. Although this may be imperceptible, ultimately the capacity reduction will result in the cell being unable to store the energy required by the specification. In other words it reaches the end of its useful life and since the capacity loss is brought on by high current operation, we can expect that battery cycle life will be shorter, the higher the current it carries. The graph below demonstrates that this is the case in practice. See below how this deterioration may be countered by providing rest periods during battery operation. Rechargeable batteries each have a characteristic working voltage range associated with the particular cell chemistry employed. The practical voltage limits are a consequence of the onset of undesirable chemical reactions which take place beyond the safe working range. Once all the active chemicals have been transformed into the composition associated with a fully charged cell, forcing more electrical energy into the cell will cause it to heat up and to initiate further unwanted reactions between the chemical components breaking them down into forms which can not be recombined. Thus attempting to charge a cell above its upper voltage limit can produce irreversible chemical reactions which can damage the cell. The increase in temperature and pressure which accompanies these events if uncontrolled could lead to rupture or explosion of the cell and the release of dangerous chemicals or fire. Similarly, discharging a cell below its recommended lower voltage limit can also result in permanent, though less dangerous, damage due to adverse chemical reactions between the active chemicals. Protection circuits are designed to keep the cell well within its recommended working range with limits set to include a safety margin. This is discussed in more detail in the section on Protection . Cycle life estimations normally assume that the cells will only be used within their specified operating limits, however this is not always the case in practice and while straying over the limits for short periods or by a minor margin will not generally cause the immediate destruction of the cell, its cycle life will most likely be affected. For example continuously over-discharging NiMH cells by 0.2 V can result in a 40 percent loss of cycle life; and 0.3 V over-discharge of lithium-ion chemistry can result in 66 percent loss of capacity. Testing has shown that overcharging lithium cells by 0.1 V or 0.25 volts will not result in safety issues but can reduce cycle life by up to 80 percent. Charge and discharge control are essential for preserving the life of the battery. Cell formation is the process of transforming the active materials of a new cell into their usable form. The initial crystal structure of the electrolyte or the electrodes is determined by the manufacturing process by which these components were made and the process of coating the electrodes. This may not be the optimum structure for minimising the internal impedance of the cell and it may not give optimum contact between the electrolyte and the electrodes. The passage of current through the cell and the heating and cooling the cell is subjected to will cause small changes in the microstructure or morphology of the active chemicals. Formation is essentially the first charge carried out at the cell manufacturer's plant under very carefully controlled conditions of current, temperature and duration to create the desired microstructure of the components and the contact between them. With some chemical formulations it may take ten charge-discharge cycles or more before the battery is able to deliver its full power or capacity. Once in use however the usage profile of the cell is determined by the user. During the lifetime of the cell, even if there is no undesirable change in the chemical composition of the materials, the morphology of the active components will continue to change, usually for the worse. The result is that the performance of the cell gradually deteriorates until eventually the cell becomes unserviceable. As the cell ages, both the chemical composition and the crystalline structure of the materials changes, larger crystals tend to form and metallic dendrites may be formed on the electrodes. As the smaller crystals created during formation of the cell grow to a larger size the internal impedance of the cell increases and the cell capacity is reduced. The crystal and dendritic growth cause a swelling of the electrodes which in turn exerts pressure on the electrolyte and the separator. As the electrodes press closer to each other the self discharge of the cell tends to increase. In extreme cases, the separator may be penetrated by dendritic or crystal growth resulting in even higher self discharge or a short circuit. Once a battery exhibits high self discharge, no remedy is available to reverse its effect. In Lithium ion cells the insertion or ejection of the Lithium ions into and out of the intercalation spaces during charging and discharging causes the electrode materials to swell or contract. Repetitive cycling can weaken the electrode structure reducing its adhesion to the current collector causing the cell to swell. This can lead to reduction in charge capacity and ultimately failure of the cell. The degree of expansion or contraction of the electrode structure depends on the materials used. The volume change in of each of the electrodes in Lithium Cobalt cells tends to reinforce each other causing the cell to swell whereas volume changes of the electrodes in Lithium Phosphate cells tends to compensate for eachother keeping swelling to a minimum. Using Silicon as the anode material instead of Carbon offers the possibility of very high charge capacities ten times better than Carbon. Unfortunately Silicon anodes are subject to a 400% volume change during charging which leads to physical breakdown of anode coating. This is still an unsolved problem and various possible solutions are currently being investigated. The so called "Memory Effect" is another manifestation of the changing morphology of the cell components with age. It appears that some Nickel based cells particularly NiCads could "remember" how much discharge was required on previous discharges and would only accept that amount of charge in subsequent charges. Nickel metal hydride cells suffer from the same problem but to a lesser extent. What happens in fact is that repeated shallow charges cause the crystalline structure of the electrodes to change as noted above and this causes the internal impedance of the cell to increase and its capacity to be reduced. Long slow charges such as trickle charging tend to promote this undesirable crystal growth, as does high temperatures and so should be avoided. It is often possible to restore a NiCad cell to, or near to, its full capacity essentially by repeating the formation process to break down the larger crystals into their previous smaller size. One or more deep discharges below 1.0 V/cell with a very low controlled current is enough to cause a change to the molecular structure of the cell to rebuild of its original chemical composition. Thus giving the cell electric shock treatment can make it lose its memory. This cure doesn't necessarily work with older cells, set in their ways, whose crystal structure has become ingrained and could actually make them worse by increasing the self discharge rate. These older cells nearing the end of their useful life should be retired. Passivation is another secondary chemical action which occurs particularly in Lithium ion cells. A resistive layer, known as the Solid Electrolyte Interface or SEI layer forms on the electrodes in some cells due to cycling, or after prolonged storage. This may be in the form of a chemical deposit or simply a change in the crystalline structure of the electrode surface. This layer impedes the chemical reactions of the cell and its ability to deliver current as well as increasing the cell's internal resistance. This barrier must normally be removed to enable proper operation of the cell, however in some cases passivation can bring a benefit by reducing the cell's self discharge. As with reconditioning above, applying controlled charge/discharge cycles often helps in recovering the battery for use. It may be possible to reverse changes to the crystalline structure of the electrodes, but chemical changes are usually irreversible. In Lithium ion cells the creation of the SEI layer during the formation process is essential for moderating the chemical reaction between the electrolyte and the carbon anode but its continued build up after formation during the life of the cell is responsible for the cell's ageing. These unavoidable parasitic chemical reactions gradually consume the cell's active chemicals and it is this loss of active chemicals which causes the gradual reduction of the cell's capacity, in other words, its ageing. See more about the chemical changes and parasitic reactions (above) causing passivation and the SEI layer. Cells tend to grow old gracefully due to the gradual build up of the SEI layer. The graph of calendar life (above) shows that the time dependent build up of the SEI layer tends to slow as the layer becomes thicker and empirical evidence suggests that the increase in the cell's internal impedance due to the SEI build up is not linear but is proportional to the square root of the time. There eventually comes a point where the passivation layer is so thick that it blocks the pores in the porous surface of the anode preventing ion transfer and intercalation into the anode's carbon crystal lattice leading to Lithium plating, which makes the situation even worse and rapid deterioration of the cell's charge capacity resulting in complete failure of the cell. Two factors are at work here, the rate of growth of the SEI layer which determines how quickly the cell ages, and the porosity of the anode surface which determines how much ageing the cell can tolerate before its pores are totally blocked, in other words its critical "End of Life" or "Death". Electrolytes and additives are selected to minimise the parasitic chemical reactions and the blocking of the anode's porous surface to reduce ageing and the particle structure of the anode surface is designed for optimum porosity to delay the onset of critical failure. High cell voltages and high ambient temperatures both accelerate the parasitic chemical reactions and thus the rate of ageing of the cells and both have a major affect on cell life. See Charging level, Voltage effects and Temperature effects above. The end of life of a battery or cell is normally specified as the point at which its capacity is reduced to 80% of its value when new, that is when it has lost 20% of its charge capacity. The critical end of life is the point at which a cell fails completely. This is normally much later than the specified "nameplate" end of life so that cells normally fade away rather than suffer sudden death. In some circumstances it may be possible to use a short cut method to determine the battery lifetime. This involves measuring the capacity loss over a smaller number of longer cycles, more representative of the cell's actual usage cycles, and extrapolating from the result to obtain capacity loss over multiple cycles. The usage cycle includes both Cycle loss and Calendar loss. The validity of the extrapolation depends on there being a linear ageing process over the useful lifetime of the battery. Recent studies at Canada's Dalhousie University have shown how the effect or extent of the passivation process and its effect on a cell's charge capacity can be estimated by measuring the Coulombic efficiency of the cell and used to characterise its lifetime performance. This method is not the conventional or recommended way of determining battery life and may not be suitable for many applications. It is included here as a useful alternative to conventional cycle testing for consideration. Note: This is not the standard definition of Coulombic Efficiency which is based on the cell's I2R and other losses per cycle. Instead it is simply based on the cell's capacity loss per cycle due to the ageing process. It does however include both the cycle losses and the calendar losses of the cell. The difference between the charge going into the cell and the charge coming out, (Qc - Qd), corresponds to the absolute reduction in the cell's active chemicals and the concomitant increase in unwanted chemical products resulting from the parasitic, irreversible chemical changes noted above which in turn cause a corresponding increase in the thickness of the SEI layer. Running cycle tests at different C rates can cause large apparent differences in the capacity loss per cycle. This is because the relative contribution of the calendar life to the overall cycle life depends on the duration of the charge discharge cycle. See Inappropriate Test Conditions above. Thus dividing the cycle loss by the cycle time we get a normalised composite loss rate for cycle life and calendar life. Further life tests on control groups of cells at Dalhousie have demonstrated that, under controlled temperature conditions, there is a good correspondence between lifetime predictions using this method compared with the actual results of conventional cycle testing which cycles the cells until the end of their specified life (when the cell capacity has fallen by 20%). The method takes into account both the cycle life losses and the calendar life losses. It shows that by means of precision measurements of the Coulombic efficiency, cell performance can be characterised by only a few, long duration cycles, with cycle times matching the period of the proposed usage. These tests can be completed in a total of about 1000 hours avoiding prolonged and expensive long term cycle testing to the death of multiple samples. For example testing with charge-discharge rates of C / 25 over a period of 1000 hours or 3 weeks would produce 20 data points representing 20 days usage from which the cell lifetime could be extrapolated. Divide the specified "End of Life" capacity loss (say 20%) by the measured percentage capacity loss rate per cycle to obtain the cycle life. Multiply the cycle life by the test cycle time t to get the calendar life. Test cells are used for only a few cycles and have a long remaining life. The method is particularly important for manufacturers of large, long life batteries for automotive and distributed network power storage uses since it enables them to assess the viability of new designs without waiting eight years or more for the results before they can launch a product. Using this method of determining the rate of capacity loss also provides a useful tool for cell designers who can very quickly compare the effect of various alternative additives used to improve cell performance with a limited number of tests without cycling each cell to destruction. Similarly this procedure enables pack makers to evaluate the performance of competing cells from different manufacturers. The method ignores, or assumes to be negligible, several ageing mechanisms which are known to affect the lifetime of the cell, making several tacit assumptions which are not necessarily justified However in tests carried out under tightly controlled conditions, experimental evidence has validated the conclusions. Some considerations are outlined here. The main assumption is that capacity loss is entirely due to parasitic chemical reactions giving rise to the build up of the SEI layer, and the consequent reduction in the quantity of active chemicals. Structural degradation and changes to the morphology of the particles making up the electrodes, such as cracking and dendrite growth are discounted as are random cell failures which are not associated with the ageing process. See also Ageing Mechanisms summary which identifies other ageing effects. Extrapolating from a few cycles always gives rise to he potential for accumulating errors. The bulk of what we need to know can be derived from measurements of Coulombic efficiency but for long term projections it is essential to carry out a full lifetime reality check on smaller sample to confirm validity of using the short term results as an indicator of long term performance and the applicability of the method. The cycle life losses may increase fairly linearly with time but calendar life losses do not. As noted above, the rate of calendar life loss is not linear as implied by this test procedure. The magnitude of this calendar loss however tends to be small compared with the cycle loss and, since its effect gets progressively smaller with time, it appears to have only a minor influence on the results. Since this is not quantified it could possibly have a significant affect on the results and in any case it would call into question the validity of any conclusions extrapolated from the measurements. Temperature dependent losses are much more significant increasing exponentially with temperature according to Arrhenius Law and can be quite large, having a major affect on the calendar life. Such losses are not time dependent however and should have a constant affect on ageing or capacity loss during the life of the battery so long as the temperature remains constant. allowing reasonable extrapolations to be made. Depending on the application, it may be necessary to carry out tests a different ambient temperatures as would be the case with conventional test methods. This does not detract from the method or its usefulness. At some point the gradual SEI build up begins to block the ion transfer completely and the cell suddenly fails. We know that with modern manufacturing process controls that the anode surface porosity and the rate SEI build up are reasonably consistent from cell to cell and also, from the above reasoning, that the rate of SEI build up per cycle is constant and equal to (1 - CE) per cycle. From this we can conclude that, for a given Coulombic efficiency, number of cycles completed up to the point of complete failure is constant. All this is very nice to know, but we don't know what that constant is. Nor does not tell us the most important point, which is "how many cycles occur before the onset of critical failure". This depends on the actual thickness of the SEI layer, the porosity of the electrode surface and the effect of electrolyte additives none of which can not easily be quantified. The only way of determining the actual failure point is by conventional cycling of a representative sample of cells to their death. At least we can make the obvious conclusion that improving Coulombic efficiency will increase the lifetime of the cells. We can be reassured however that cells are normally designed so that this failure point is well beyond the conventional specified cycle life which is when the accumulated capacity loss is 20% of the nameplate (new) capacity. In the attempt to make the test profile represent the actual usage profile of the cell, the C rates used in the tests are reduced so that the test cycle time is increased to match the typical usage time between charges. This is still not truly representative of the actual usage profile because, within each actual usage period, the C rate can vary considerably from short periods at very high C rates to long periods of zero use as would be the case with typical automotive applications. We know that very high charge-discharge rates have a damaging affect on battery life, so that for accurate results, the test profile should be based on the actual load profile of the battery, such as a standard simulated driving cycle, not on constant C rates. See Charging rate above. The very small changes in the charge levels per cycle are difficult to measure accurately and suitable test equipment is not readily available off the shelf. For reliable results, tests have up to now used custom built, very high precision current supplies and test instruments. Determining the Coulombic efficiency is not as simple as it sounds. The capacity loss (Qc-Qd) during a single cycle is very small amounting to 0.002% of the capacity of a battery with a specified cycle life of 1000 cycles and 0.0002% for a 10,000 cycle battery. Using precision measurements of Coulombic efficiency provides an excellent method of characterising many aspects cell and battery performance providing very quick answers with reasonably small samples. It enables technologies to be ranked by their Coulombic efficiency and is particularly useful as a lab tool for comparing the affects of alternative materials on cell performance. Battery pack designers will also find it useful as a quick for comparing the performance of competing batteries from different manufacturers. Significant risk arises however in using the method to determine the lifetime performance of the cells since the accuracy of extrapolated results is questionable. The method is useful for comparing the ageing rates of various technologies, but it can not currently provide absolute answers to life cycle or calendar life expectations without resorting to testing at least some of the cells over their full lifetime until they actually fail. Any reduction in the volume of the cell's active chemicals will of course directly reduce the cell's electrical capacity. At the same time the cell's potential cycle life will automatically be reduced since the cell's useful life is defined to be over when its capacity is reduced by 20%. Electrolyte may be lost from leakage due to the deterioration over time of the seals closing the cells. Even with good seals the solvents in the electrolyte may eventually permeate through the seal over a prolonged period causing the electrolyte to dry out particularly if the cells are stored in a dry atmosphere or if the cell contents are under pressure due to high temperatures. However the loss of electrolyte is not just due to the physical leakage of the electrolyte from the cell, the electrolyte may be effectively lost to the electrochemical system because it has been transformed or decomposed into another inactive compound which may or may not remain inside the cell casing. Corrosion is an example of this as are other compounds which may have been caused by overheating or abuse. Gassing and evaporation are two other mechanisms by which electrolyte may be lost thus causing an irreversible loss in the capacity of the cell. In order to prevent the loss of electrolyte from secondary cells in which the electrochemical charging cycle produces gaseous products the cells must be sealed. Closed cycle systems in which the gases are made to recombine to recover the active chemicals are called recombinant systems. NiCads and SLA batteries use recombinant designs. This gassing process tends to limit overcharging and also serves to balance the voltages or charge levels of the cells in a series string. Lithium ion cells do not produce gases during the normal charging or discharge processes so recombination does not apply to this cell chemistry. If gassing does occur in Lithium cells, it is usually the result of irreversible breakdown of the electrolyte and possibly the first stage in thermal runaway of the cell. Although most modern cells have a sealed construction to prevent loss of electrolyte, they usually have a vent to relieve pressure if there is a danger of the cell rupturing due to excessive pressure. Whenever a vent operates, it releases or expels some of the active chemicals to the atmosphere and hence reduces the cell's capacity. To determine whether electrolyte loss through venting has occurred, the suspect cell can be weighed and its weight compared with the weight of a known good cell of the same make and capacity. Leakage used to be a major problem with Zinc Carbon cells. This was because the zinc casing took part in the electrochemical discharge reaction. During the lifetime of the cell, the cell walls become progressively thinner as the zinc is consumed until they become perforated allowing the electrolyte to escape. The escaping chemicals also create corrosion on the battery terminals compounding the problem. New cell constructions and modern materials have significantly diminished this problem. Nevertheless some cells may still leak due to poor sealing or corrosion problems. See also Weibull Analysis and Methods of Estimating Battery Lifetimes. Battery life is also affected by variations in the materials and components used in manufacturing the cells and although manufacturers try to keep these variations to a minimum there will always be a spread in the properties of the materials used within the tolerances allowed. Ultimately the consequences of these tolerance spreads will be reflected in the lifetime of the cells. These factors also explain the wide disparity in performance of similar cells from different manufacturers. The quality of the active chemicals may vary, particularly if more than one source of supply is used. This may affect the concentration of the chemicals or the level of impurities present and these factors in turn affect the cell voltage, the internal impedance and the self discharge rates. Variations in the dimensions of the components or in the placement of the parts making up the cell can also affect the cell performance and life expectancy. Burrs and slight misalignments can cause short circuits, maybe not immediately, but after repeated temperature cycling. The filling of the electrolyte may be incomplete resulting in a corresponding reduction in cell capacity. The granularity of the chemicals and the surface finish on the electrodes both affect the current carrying capacity of the cells. This can occur in multi-cell batteries and is a consequence of the spread of operating characteristics of the individual cells in the pack. This may be due to manufacturing tolerances as noted above or uneven temperature conditions across the pack or non uniform ageing patterns which cause some cells to accept less charge than others. The result is that in a series chain, a weak cell with reduced capacity will reach its full charge before the rest of the cells in the chain and become overcharged as the charger attempts to charge the overall cell chain to its nominal voltage. As already noted, overcharging causes the cell to overheat resulting in expansion of the active chemicals as well as the possible gassing of the electrolyte. These factors in turn cause the internal pressure to rise, resulting in overstress and possible damage to the cell. This will be repeated with every charge-discharge cycle causing the cell to become more stressed and hence even weaker until it eventually fails. On the other hand, if for some reason the weak cell can not reach full charge, perhaps due to a very high self discharge, or in an extreme case, a short circuited cell, then the good cells, rather than the weaker cell, could possibly become overcharged. Damage to weaker cells can also continue during the discharge cycle. When discharged in a series configuration the capacity of the weakest cell in the chain will be depleted before the others. If the discharge is continued (to discharge the remaining good cells), the voltage on the low capacity cell will reach zero then reverse due to the IR voltage drop across the cell. Subsequent heat and pressure build up within the cell due to "cell reversal" can then cause catastrophic failure. The initial tolerance spread which caused these interactions may be very low but it can build up over time as the damage increases with every charge-discharge cycle until the weak cells eventually fail. The simplest and most obvious way of getting the maximum life out of a battery is to ensure that it always works well within its designed operating limits. There are however some further actions which can be taken to increase the battery life. These are summarised below and in depth explanations and examples are available by following the links. Reduced oxidation of electrolyte resulting in fewer parasitic reactions and reduced thickening of the SEI layer. As noted in the section on Charging most battery failures are due to inappropriate charging. The use of intelligent chargers and safety systems which prevent the connection of unapproved chargers to the battery may not extend battery life but at least they can prevent it from being cut short. Providing regular rest periods during operation of the battery allows the chemical transformations in the battery to keep pace with demand for current. See how this is implemented in a Software Configurable Battery without interrupting the power delivery. For pulsed applications the peak load on the battery can be reduced by placing a large value capacitor in parallel with the battery. Energy for large instantaneous loads is supplied by the capacitor effectively reducing the duty cycle and stress on the battery. The capacitor recharges during the quiescent periods. Claims of a sixty percent increase in cycle life are made for this technique. Another benefit of this arrangement is that since the battery supplies less of the instantaneous peak load current, the voltage drop across the battery will be lower. For high power pulses this voltage drop can be very significant. The higher the cell voltage the higher the chemical stress on the battery and the longer the battery remains at high voltage the greater the deterioration. The most likely cause of premature failure of a battery is abuse, subjecting a battery to conditions for which it was never designed. Apart from obvious physical abuse, the following examples should also be considered abuse, whether deliberate, inadvertent or through poor maintenance disciplines. Drawing more current than the battery was designed for or short circuiting the battery. Using undersized batteries for the application. Circuit or system designs which subject the battery to repeated "coup de fouet" (whiplash) effects. This effect is a temporary, severe voltage drop which occurs when a heavy load is suddenly placed on the battery and is caused by the inability of the rate of the chemical action in the battery to accommodate the instantaneous demand for current. Operating or storing the battery in too high or too low ambient temperatures. Using chargers designed for charging batteries with a different cell chemistry. Overcharging - either to too high a voltage or for too long a period. Over-discharging - allowing the battery to become completely discharged. In aqueous batteries - allowing electrolyte level to fall below the recommended minimum. In aqueous batteries - topping up with tap water instead of distilled water (or inappropriate electrolyte). Subjecting the battery to excessive vibration or shock. Battery designers try to design out the possibility of abuse wherever possible but ultimately the life of the battery is in the user's hands.